Once upon a time, I wrote about the Best 404 Page. Period. It was an honest-to-goodness movie; a battle scene depicting special ops forces trying to recover the rogue page. In a word: genius. But NotFound.org seems to have come up with an even better 404 page: One that can bring home missing children. The 404 page is one of the most recognizable and most consulted pages on the web. It is also an inexhaustible source of frustration for those who just happen to land on one. Missing Children Europe and Child Focus have decided to make this hitherto useless space meaningful through the NotFound project. Knowing that there are more than 644 million websites worldwide and that Belgium alone has 1.3 million domain names, one soon realizes how much space these error messages occupy. It's the digital age equivalent of the milk carton. Now that's genius. 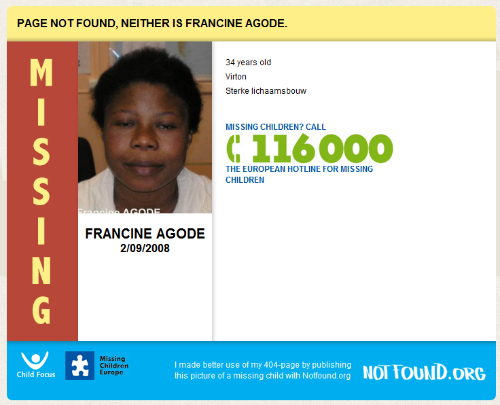 Their goal is to turn every 404 page in the European Union into a missing kid ad. Now, there might be more visible pages on websites that could lead to higher page view counts but that would require convincing organizations and individuals to give up valuable real estate on their sites. Using 404 pages means that NotFound is focusing on pages that web managers barely think about after they are initially designed. The 404 just exists out there, in the event that it's needed. It's a very low risk place to host external content, as long as it doesn't prevent users from reaching their destination. In most instances they will likely do that with the back button, so the extra content likely isn't going to negatively impact the user experience. I can't imagine why no one has thought of this before. I just wonder one thing: How long before we get this in Canada?